I am looking to automate an email alerting process for sharepoint online task list. I am working with SharePOint online and using OOTB task list not a custom list. 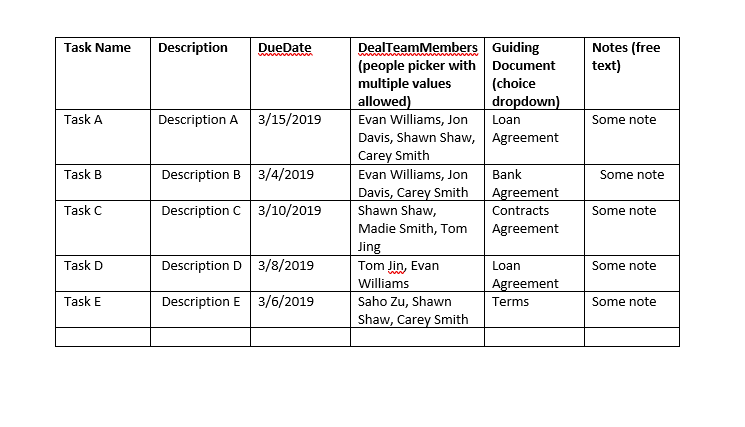 AS shown above, DealTeamMembers is a people picker column with multiple values allowed, guiding document is choice drop-down, DueDate is date and others are free text type columns. I am looking to send only one digest email every monday morning 8 am to the users mentioned in DealTeamMembers column indicating list of tasks that are due in next 15 days and obviously ones that are not completed yet. I do not want to send separate emails to each user for different tasks rather one email listing all tasks that he is part of through DealTeamMemebers column. So for example when email runs, Evan Willimas should see something like below in his inbox with the body displayed in tabular format. Similarly Carey Smith would see info about Task A, Task B and Task E in her inbox. Again no separate emails just one email listing all task info. I don't know if this is possible to do in Flow as People picker has multiple values allowed to be used, So i also going to tag C# console app, may be an exe that can be scheduled to run every monday through task scheduler. FYI, I am working with SPOnline, any help is appreciated. Browse other questions tagged sharepoint-online csom tasks task-list flow or ask your own question.